November would be a very quiet 'finding treasures' month without Church White Elephant Sales and Bazaars. A 12" Replo Canada Snowblow Santa was my favourite find this month. 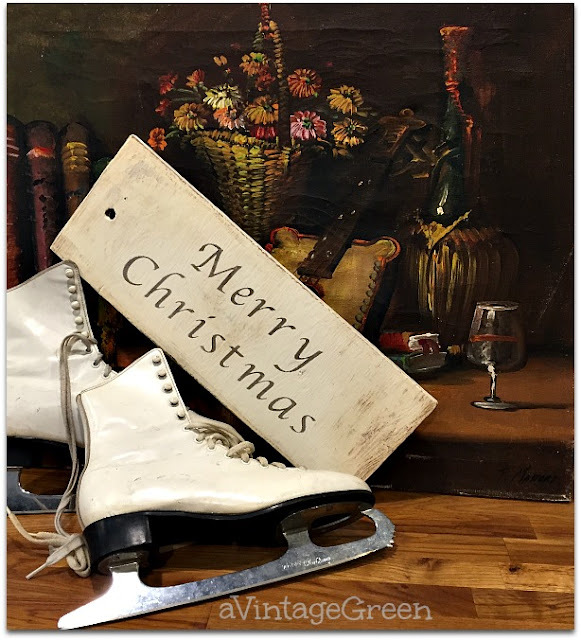 The oil painting below was found in a friend's garage and she gave it to me, makes a great background for the ice skates and Merry Christmas Sign. My favorite Church Christmas Bazaar and White Elephant Sale was held the first Saturday of November this year. The ladies and gentlemen were so welcoming and one sweet lady announced to everyone - "I know her, she's a friend" and then later, sweetly, when my purchases were added up, asked me very nicely if I could 'round it up' - which I did. The wooden truck (home built) was a treat to find. Toys always seem so happy. Grouped the animals from the White Elephant Sale together for a photo op. I think the sheep had quite a bit to say but the mouse just laughed and ignored them. The foxes kept careful watch. I once had this Christmas 78 record We Wish You a Merry Christmas when I was young and I loved playing it (and all the other great childrens 78's we had, on our portable record player). I found several 78's tied together and bought them without even looking at the records. 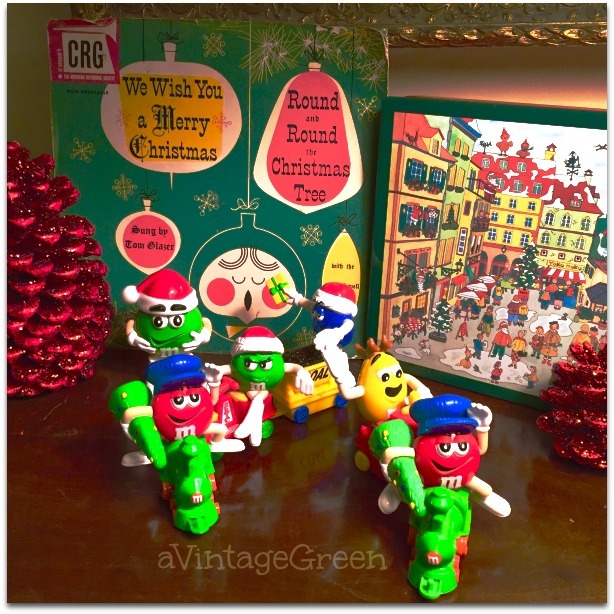 Christmas plastic train characters add some frivolous fun. The Size 4 Riedell Ice Skates were found at a school garage sale, I was so happy to find them - they always look great added to a large wreath. My favorite thrift store gets great donations from the community and shares them out again at reasonable prices, always a pleasure to shop there. Evening photo - by 4:20 it is night dark. I may have overdone the photos of November finds, but the Church Bazaars are treasure troves. Silver coloured metal wall shelf, 4 candles holder in a tree form and a brides basket (as well as the amber blown glass decorated goblets) and a napkin holder were found at my 2nd favourite Church sale mid-month. 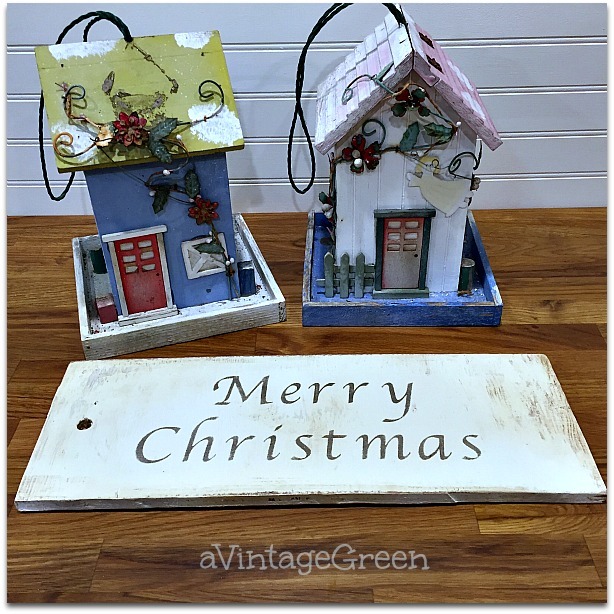 I found the two faux bird house feeders at the November 4th White Elephant Sale - and made a Merry Christmas Sign to go with them. I used the Cricut/software to make the stencil (it took a few tries to get things to the size to match the board). Read the picture below (see that red arrow) left to right and down then left again. 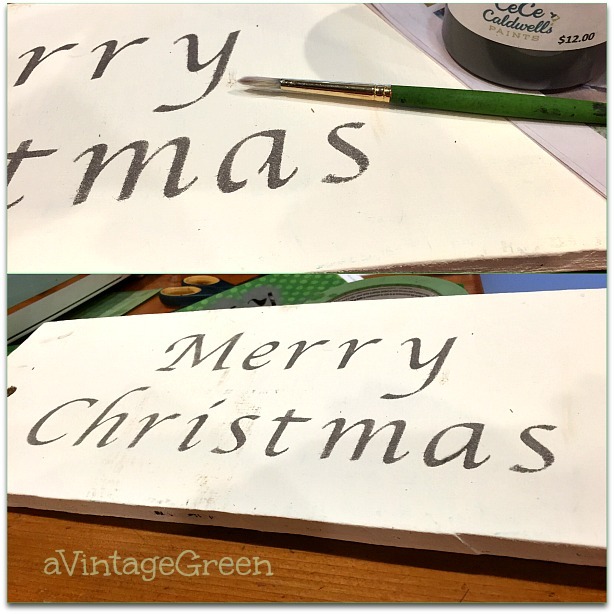 The letters 'e' and 'a' were 'sliced' when making the stencil on the Cricut and they need to be filled in. My tutorial for slicing is here. I use a fine brush making multiple tiny dots to fill in the missing pieces of any letters that were sliced. Next up was sanding the sign edges and any area that looked like they 'should' be sanded. Waxed the sign - clear first then dark - then polish. I was so happy with my first sign that I made another. 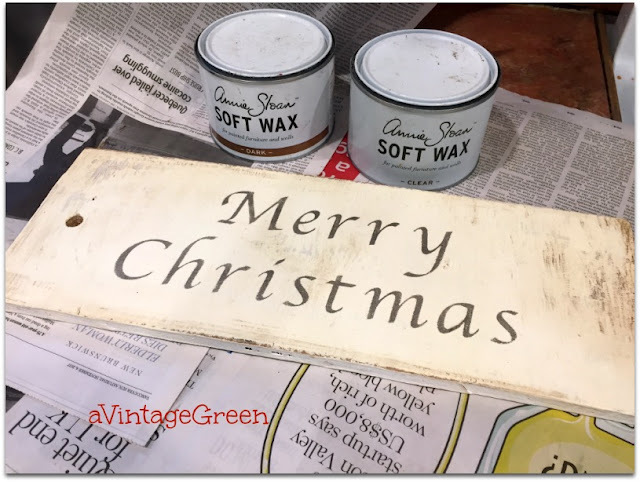 Painted the board ASCP Pure White and used CeCe Caldwell Beckley Coal for the stencil. Church sales have the best things for great prices. I love so much of what you found Joy! Oh those ice skates are adorable! Happy December! Love your little Merry Christmas sign. I do love church rummage sales (what they're called here!) and there is a Christmas one coming up Saturday. It will be the last till Spring. I can only rely on Goodwill all winter! Great finds and I love your sign! You sure found lots of goodies, I like the 3 sheep and also the Merry Christmas signs you made. Great treasures, Joy! I found November to be a very busy buying month for myself, at a time when I really didn't want to shop for resale (but did for fear of fewer finds in winter). 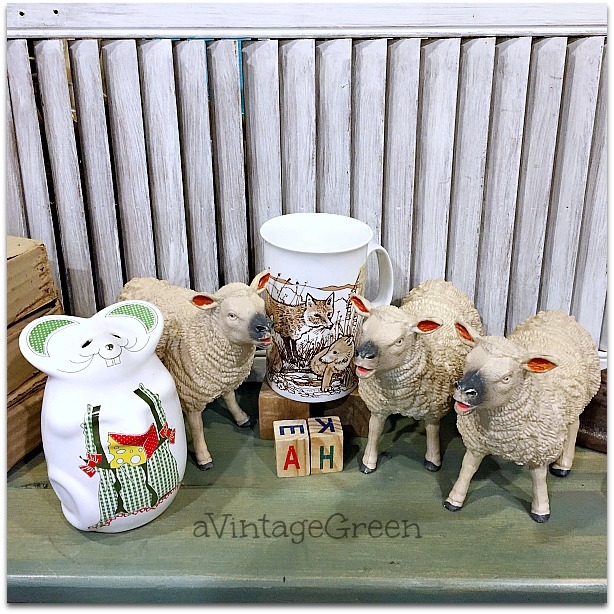 Love the sheep! 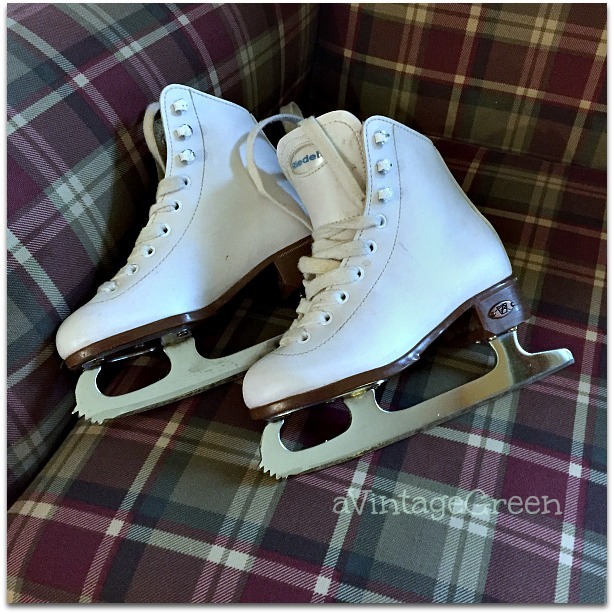 I found a pr of Reidell youth skates just like yours earlier in fall. 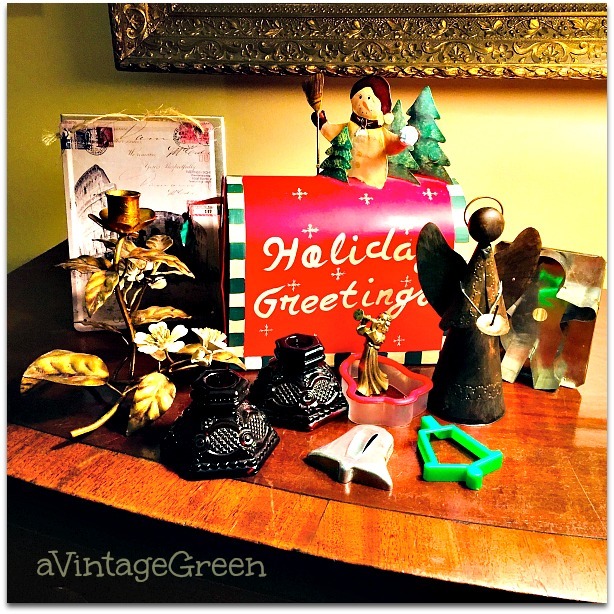 Enjoy your holidays, I always enjoy seeing your finds and how you craft things. 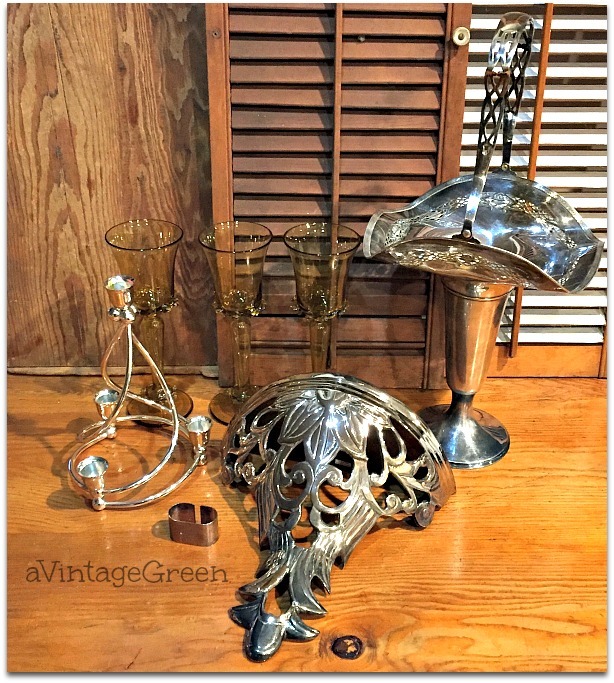 What a lovely collections of great finds! 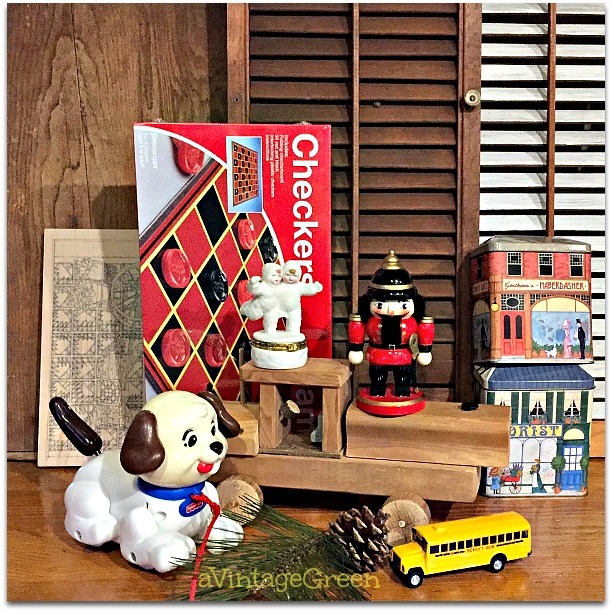 Joy, thanks for sharing your wonderful finds at Vintage Charm! Love the ice skates! Joy, you have found so many wonderfully festive things. I love them. When I was a kid, we had a Santa like that - it lit up!!! What a set of treasures! O my Goodness!! I love all your finds!! 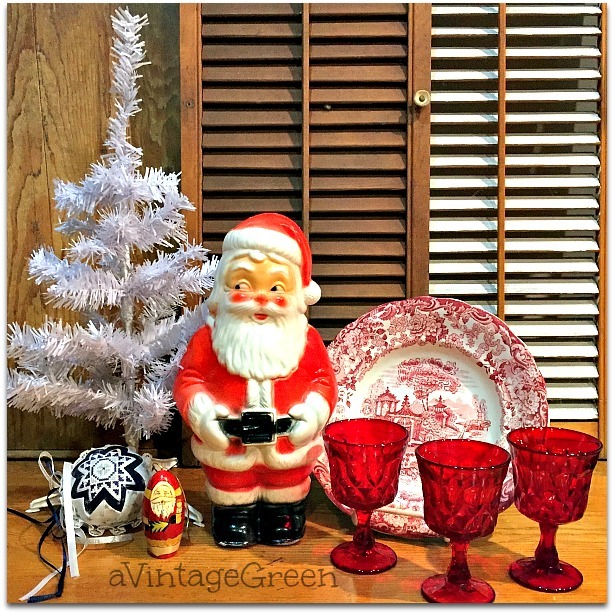 So many wonderful vintage treasures!! And you did a great job on the stencil project!! Love the wreath and ice skates, the Santa with the cheeky grin and the smiling puppy dog would all be coming home with me today! Great signs as always and another simple but useful tutorial on correcting alphas that get "sliced". Thanks. You always find the best items, Joy. You must have a knack for it! I enjoyed seeing your 'hauls' from the various sales! You found some terrific little goodies! 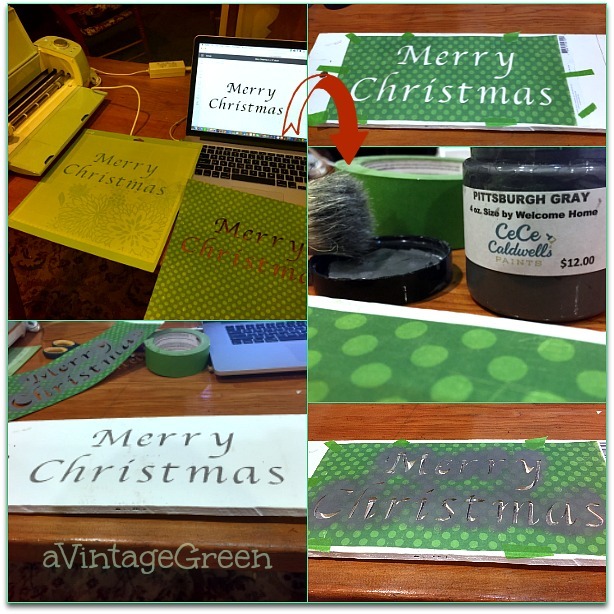 I'm also happy to know that I'm not the only one that has occasional Cricut issues! Thanks for sharing ... and, belatedly, happy pink saturday! Joy I have just rediscovered garage and yard sales. They are such a great way to find treasures, as your post is full of so many great buys. You found some great treasures. I'm amazed at the 78 record! I bet kids of today have no clue what it is! Thanks for sharing at Party in Your PJs link party! 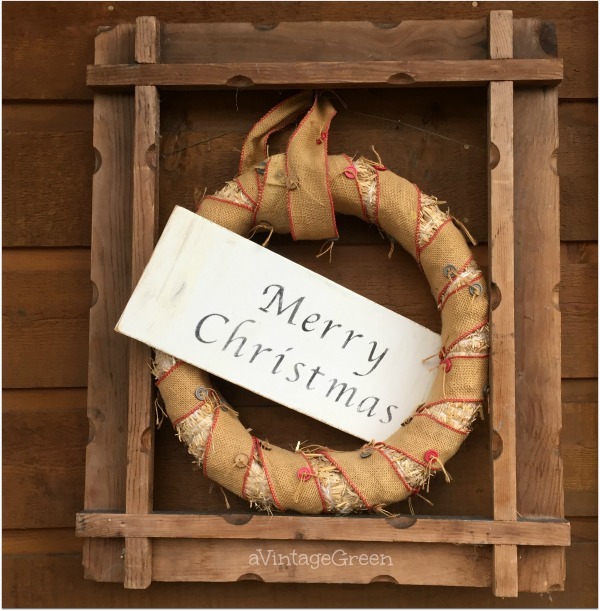 Your little Merry Christmas sign is great. My favorite is the little dog you pull along, my boys had one. Yours looks in great shape and so cute.